Transportation Costs > How Much Does a Segway Cost? The Segway is a two-wheeled vehicle that allows an individual to move easily from one place to another. It can run up to 12.5 miles per hour and are powered by rechargeable batteries. The price of Segways can depend on the model, condition and where it’s purchased from. The Segway can range anywhere from $5,000 to $10,000 brand new, depending on the model of the unit. Refer to our table below to see what most dealers are charging for a new model. A used one, from the research we compiled, were often half the prices noted below and had an average of 600 to 1,000 miles on it. For instance, Segway of Los Angeles lists the MSRP on its website. The i2 SE starts at $5,999, while the x2 SE starts at $6,499. The newest model, the miniPRO, starts at $798. Newer units will come with rechargeable batteries, cables used to charge the batteries and a wireless Info Key controller, at a minimum. Depending on the type of Segway, most can reach speeds of up to 12.5 MPH, have a range of 24 miles on one battery charge, and can weigh up to 120 pounds. 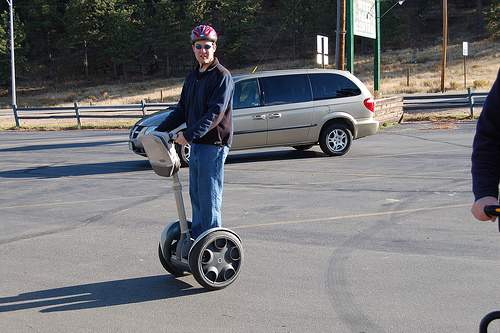 Most of the newer Segways are going to run on lithium-ion batteries. To get more information, visit their official FAQ webpage. A new Segway and its battery will be covered by a limited one-year warranty. i2 Personal Transporter Completely versatile and eco-friendly, the i2 can travel 24 miles on a single battery charge. Depending on the terrain, the i2 can move both backwards and fowards. Traveling faster than 12.5 mph, it has a built-in alarm, wireless controller and other various features. Segway Xt Providing enhanced performances compared to the personal transporter, the Xt can travel on uneven terrians, dirt and pavement. Deisgned to protect the rider from debrise, the Xt is ideal for those that want to travel outdoor trails. X2 Golf Designed for golf courses, the x2 can hold a golf bag and work uneven terrain. Ideal for traveling all sorts of golf courses, this is a great alternative to golf carts. X2 Personal Transporter Features a wide platform, optimized for rider comfort and is equipped with gliding lights so that the rider is easily seen on the go. This Segway is designed primarily for law enforcement and can go 12 miles on one charge. I2 SE PATROLLER Features a wide platform, optimized for rider comfort and is equipped with gliding lights so that the rider is easily seen on the go. This Segway is also designed primarily for law enforcement and can go 24 miles on one charge. PERSONAL TRANSPORTER Designed for wide-open areas, such as farmlands and even construction sites, the X2 SE is the perfect fit for any outdoor situation, according to the official Segway website. Its deep threaded ATV-style wheels can handle virtually any terrain. One S1 Unlike the Segway you're accustomed to seeing, this one wheel, electric, this self-balancing gadget can work for anyone. mini PRO Even though it looks like a toy, the mini PRO is far from one. Developed with precise advanced balancing technology, this Segway works with your smartphone, syncing it with its sophisticated software to create a smooth ride 24/7. Ninebot This hands-free balancing scooter is known for its kneel control bar that allows you to weave in and out of any tight space. Like the mini PRO, it has a Bluetooth remote control to keep it up to date. A Segway offers several additional accessories that you can purchase to enhance your experience when riding the unit. Through their official website, you can purchase different accessories, such as a handlebar bag ($160~), LED headlights ($175), a LED taillight ($20), parking stand ($80), an infokey protector ($20) and/or upgraded comfort mats ($150), for various prices. When your battery runs out and it has reached its maximum number of allowable recharges, you will have to purchase a new one. Like any mode of transportation, repairs and replacement parts may need to be budgeted for the future. Keep in mind that all public areas may have restrictions with Segways. It’s important to know your local laws to make sure that something like this is legal. A Segway does have certain weight restrictions and usually maxes out at 275 pounds. Highly consider purchasing a Segway used on Craigslist, eBay or online retailers that specialize in used sales. For example, segwayofcentralflorida.com has a handful of used listings, with most up to half off of the MSRP.